Shop Access Virus TI2 Keyboard Synthesizer from AMS with 0% Interest Payment Plans and Free Shipping. 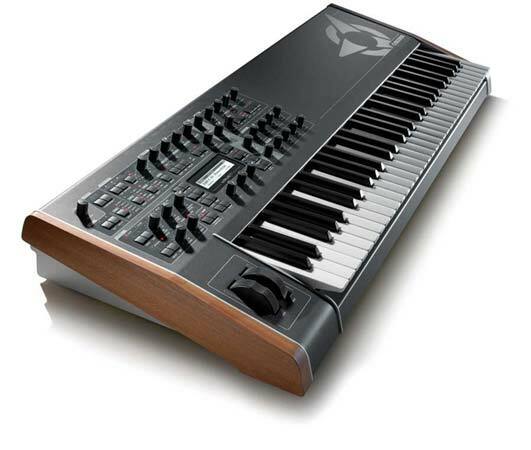 The Access VIRUS TI2 synthesizer keyboard is designed to lead the world in a completely new direction. Total Integration uses innovative technology to greatly expand the VIRUS Synthesizer, resulting in an advanced stage/standalone instrument, while simultaneously extending the product capabilities with a suite of compelling studio integration features. Dual DSP system with over 80 stereo voices under average load. The Virus TI2 Synthesizer has 25% more calculating power and sports a redesigned housing and front panel than its predecessor. Access also used new materials to bring down the weight of the keyboard. On the software side of things, a major feature update, OS3, adds several new FX such as a Tape Delay, Frequency Shifter and several new Distortion algorithms along with an added feature called Character. Character allows you to adjust the overall tone of a preset reminiscent of several vintage and well-known synthesizers. In addition you can emphasis certain aspects of the patch to allow it to cut better through the mix, or fade it into the background with an extra-wide stereo field. The new distortions were built from scratch and feature an extreme dynamic range along with sophisticated controls to tailor the sound to your specific needs. They can add everything from warm, tube-like overtones to complete sonic deconstruction more reminiscent of circuit-bending. The new algorithms also include a revamped bit and sampling-rate reduction, allowing you to change the quality and cutoff point with precise, continuously variable control. The stereo Frequency Shifter and the new Ring Modulator are state of the art algorithms modeled with old '70s stomp boxes in mind. The Tape Delay goes way beyond the possibilities of the real Tape Delays in the '60s and '70s. It smoothly syncs to tempo, lets you decide if a Doppler effect takes place when changing the tempo, and even switching the delay time between presets is all smooth, making it perfect for performers. Last but not least, a modification to the main VCA algorithm enables OS3 users to design gating FX known from electro and minimal influenced music. Virus Control has received a completely redesigned user-interface thanks to various improvement requests over the last years. The plug-in now features a side chain input allowing you to mangle audio from a sequencer track with the FX and sound engine of the hardware Virus (for selected hosts only).